Dennis Rosen, chairman of the NYSLA, says he's creating a fair playing field. Critics say he's vindictive. Business is getting tougher for wine merchants in one of America’s biggest markets, and consumers may pay the price. The New York State Liquor Authority (NYSLA) is taking a dramatic new tack in its role as regulator of alcohol sales in the state. The independent agency, created after Prohibition, is expanding its reach and heightening enforcement as part of an initiative by NYSLA chairman Dennis Rosen to reform what he sees as an unfair marketplace. To ensure those rules are followed, Rosen's team has imposed more than $3 million in fines on wholesalers and retailers in the past three years. According to Rosen, first appointed in 2009, the rules are designed to make sure wholesalers and retailers aren't engaged in sweetheart deals. They are the latest tactic of this former assistant attorney general's multi-year campaign to improve efficiency and oversight at the agency. Before the new regulations, it was standard practice for wholesalers to offer discounted wines or rare wines to retailers who were loyal customers. The new NYSLA rules forbid those kinds of deals, mandating that wholesalers post prices with the state in advance of all sales and that all retailers have access to discounted and limited-availability wines. The new rules impact business in what is already a highly regulated market. "Where do they come off dictating everything to us and ruining this industry?" asked Rona Vesce, wine and spirits manager at Peekskill-based distributor D. Bertoline & Sons. "Their guidelines are absolutely ridiculous, more and more. How do you not allow us to keep beer and wine in the same warehouse? It’s alcohol!" Other members of the industry, however, are taking the new regulations in stride. "In one or two cases, we’re getting significantly less wine than we would have," said Jamie Wolff, partner at Chambers Street Wines. "But I’m hoping in the long run that this is balanced out." The first fine triggered by the NYSLA's new rules came in October 2011, when wholesaler Winebow paid a $600,000 penalty for anti-competitive market behaviors and failure to cooperate with an investigation. In October 2013, Southern Wine and Spirits settled for $200,000 over charges that it failed to post prices. The NYSLA fined wholesaler Empire Merchants $600,000 for selling discounted products to select retailers in March 2014. Just this week, Palm Bay Imports agreed to pay $750,000—the largest fine ever paid to the NYSLA for a disciplinary case—for six charges of non-compliance including failure to post discounted prices which were offered to a small group of preferred retailers. In all, the NYSLA has collected $3.1 million in fines over the past three years. The chairman is also spearheading a crackdown on interstate retailer shipping (it’s illegal for a New York resident to order wine directly from an out-of-state retailer, but New York retailers may legally sell wine to customers in other states that allow such sales). In July 2013, the NYSLA revoked the license of Brooklyn retailer Liquors Galore for violating the shipping laws of at least 17 states. Dennis Rosen grew up in New York City, the son of a small businessman. After graduating from Brooklyn College and Harvard Law, he worked for Legal Aid of New York for 10 years, followed by nearly three decades with the state attorney general’s office. He now presides over the NYSLA from his office in Albany, commuting to the authority’s Harlem office twice a month for hearings. The Harlem office shares a building on Lenox Avenue with the New York Lottery; the office ambiance feels closer to DMV than to City Hall. It’s a workman-like atmosphere, but Rosen has an easy rapport with his staff, trading jokes before he sat down to discuss the new rules. Rosen’s first dealings with the NYSLA came as an adversary of the agency: Beginning in 2005, under Attorney General Eliot Spitzer, Rosen was an assistant attorney general charged with investigating corruption in New York's alcohol industry and the NYSLA’s oversight of it. At the end of the 15-month investigation, Rosen drafted three consent-judgment court orders, agreed to by New York's major producers, distributors and retailers, that doled out $4.6 million in fines but also clarified the NYSLA’s policies. “My main mission was to address the lack of clarity, and to go to great length to describe what was OK and what was not OK,” he said. Rosen’s successful turn at cleaning up the NYSLA and its policies led directly to his appointment as authority chairman by Gov. David Patterson in 2009. There was still considerable work to be done in an alcohol oversight agency critics called perennially dysfunctional. First, Rosen set about reducing the more than 1,500 guideline advisories issued by the NYSLA since the end of Prohibition down to roughly 350 and made them visible to all through the authority’s website. At the same time, he made staff changes to improve efficiency of applications and enforcement. Government cutbacks have reduced the NYSLA’s staff by about 20 percent in the time that Rosen has served as chairman, but, according to the agency, its 120 employees operate with greatly improved efficiency thanks to streamlined application processes, a revamped website and other technology advancements implemented under Rosen’s watch. Rosen inherited a backlog of 3,000 licensee applications when he took office, which at the time each took an average of nine months to process. Since 2011, according to the NYSLA, the average time to process a manufacturing license in New York has dropped from 83 days to 38 days; liquor store license application waits have dropped from 142 days to 58; restaurant and bar applications have fallen from 100 days to 43; grocery stores from 101 to 38. 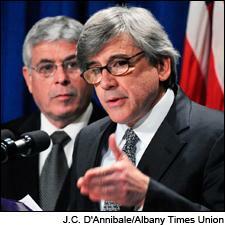 Rosen’s reappointment as NYSLA chairman by Gov. Andrew Cuomo was unanimously approved by the New York state senate finance committee in June. At the confirmation hearing, Sen. Tim Kennedy called the NYSLA's performance over Rosen's first term a "tremendous turnaround." "You’ve taken one of the least effective agencies in the state and turned it around into one of the most responsive,” Sen. Catharine Young said to Rosen, adding appreciation for his heavy focus on developing new economic opportunities for New York wineries, breweries and distilleries. Even some of those subject to Rosen's expanded regulations credit him for improving NYSLA efficiency. "[The NYSLA] is pretty progressive in doing all the filings electronically, because New Jersey doesn't do that," said Regal Imports owner Charlie Trivinia, who does business in 35 states. "Most states we're still submitting paper." But now, some industry members believe Rosen has gone too far, forbidding what they consider fair business practices. They also accuse the NYSLA of being vindictive. Many New York licensees are hesitant to speak out and some who did agree to speak to Wine Spectator asked not to be identified. Nevertheless, industry sources who might call on Albany to change the rules say they are cowed by the possibility of being investigated. “I’m very wary of drawing their gigantic, flame-ringed evil eye in my direction,” said one specialty wine retailer who admitted being “loathe to repeat” a previous “disagreeable run-in” with the NYSLA. Multiple sources within the industry say they believe that the out-of-state wine-shipping charges against Empire Wine stem directly from the upstate retailer’s refusal to cooperate in the 2013 investigation of distributor Winebow. A source with knowledge of that investigation confirmed that Empire Wine was the recipient of an illegal discount, not offered to other retailers, on Winebow’s allotment of Duckhorn Napa Cabernet, and that the NYSLA was displeased with Empire’s insufficient cooperation. “This appears to be somewhat of a retribution situation,” the source said. Wine retailer Daniel Posner in his store. He is one of many who fear the NYSLA will cripple his business. Multiple industry members complain that their fear of investigation leaves them little recourse for trying to change the new regulations. NYSLA - keep up the good work. We have the same problems in Ohio. I'll be very interested to revisit this article to see the response from readers. As I run a small specialized wine boutique in Calgary, AB (Canada), a province with privatized retailers, I have to respect what Mr. Rosen is doing. We have seen similar crackdowns in our province in regards to the 'unfair' advantages some retailers may receive due to size or relationships they may have in the industry. Standardized pricing only makes sense and I didn't see anywhere that said a retailer can't get the product they want, they will just have to pay the same as the next place, big or small. Maybe this means you will only receive 8 cases as opposed to 12, but as a business that is yours to decide. Why shouldn't the shop down the street have the opportunity to sell a product and create competition in the market? We also have regulations that forbid the shipping of wine across provincial borders (as a retailer). Again this makes sense when considering that different states/provinces have different taxation levels. Would I love to sell and ship wine to friends and family back in Ontario, absolutely! This is especially true with the product diversity we have in Alberta, but again why would I want to see a decrease in sales from producers I grew up around, or impact a local trade I am passionate about. If a producer wants to sell wine in a different state it is their responsibility to source out a suitable agency in that state to do so. Growing up with the Finger Lakes in my backyard, I am happy to see the focus on NYS wineries and breweries. New Yorkers should be excited too! I actually carry a great line from Fox Run Vineyards in a predominately Italian wine store, and am very excited for the collaboration between Selbach-Oster and Paul Hobbs in the upstate! Keep up the good work Mr. Rosen and the NYSLA! There goes Open Market...if you can do it, do it! So, now New York should adopt the same system as Canada? Yes, there are many issues with this new "guidance." For starters, most of these fines are enforced not for breaking NYS law, but rather breaking new "guidance" set forth by the NYS Liquor Authority. Allocations, closeouts, limited availabilities, restrictions, price posting, no presell by wholesalers, etc etc etc are many of the issues that we are now facing. I think everyone should have the opportunity to buy all kinds of wine. But there is a lot of wine produced. Should I lose 90% of my allocation on a wine that I have bought numerous vintages of because the wine for Wine Spectator Wine of the Year? It happened to me this year. What do I tell my clients? Go buy it from the competition up the road, because the government says that I cannot have what I got last year because it received a high score? I think not. Does the new I Phone get highly allocated to each Verizon store? Does Tesla have to allocate its new release cars to ensure that every state in the union gets the same amount of automobiles? Does Coca Cola put limitations on how much Tropicana is sold to each supermarket? Does Entenmann's restrict the sale of its donuts by shopkeeper? Why must wine be put on such a pedestal? Does all of this sound silly? I just want to buy and sell wine. I welcome the competition. I embrace it. I am for wine in grocery stores. In 15 years, I have never disputed a new licensee application that has been filed within my domaine, which is my legal right according to the NYSLA. I want more stores. I want more access to consumers. But I just want to buy and sell wine. The idea proposed by Mr. Rosen of "leveling the playing field" is absurd and downright un-American. By using that reasoning, should the government restrict large retailers, such as dept. stores, from buy quantities of merchandise at price breaks unavailable to small Mom & Pop stores? I used to be in an industry that had franchised dealers/resellers. Some of those resellers made deals with its manufacturers, usually involving large quantity commitments, that got them preferential pricing. While the smaller dealers felt that they were at a disadvantage price-wise, they realized that this was how the business worked and learned to compete in other ways. Business in this country is not based on a level playing field and a government agency has no right to interject itself to attempt to artificially create one. There goes the dead hand off government once again putting its nose into private business. How many members on this NYSAuthority have actually made payroll and have any idea about running a business.. Better just to shut it down, save the money and let the market do the job. There are several different matters brought up in the article. Some can be said to contradict the idea of fair business practices, and some are actually pretty on spot with regard to bringing fairness back in the industry in NY. One thing that Mr Rosen is absolutely correct about is that there are behind the curtain deals that some distributors reach with certain (large) retailers. There are wines that on the paper are available for allocation, meaning, precisely as Mr Rosen says, that any retailer in NY should be allowed to sign up for these wines, and the limited stock should be distributed among those who signed up; however, year after year after year these sought after wines go in large volumes to a limited number of retailers, and if you ask the distributor why it happens, the answer is plain and simple - it is arranged for the purpose of maintaining a nice relationship with a large retailer. The practice contradicts the rules of NYSLA going back much before Mr Rosen got his office, so he is right in his effort to reintroduce the true Fair Play in the way allocated wines are made available to all retailers, not only a selected number. Are you a NYS retailer? Can you site some examples of wines that you are unable to obtain because of these "unfair" business practices? Are you aware that NYS is currently the ONLY state in the union operating under such strict guidelines of "allocating" wine. Have you read the guidelines? Are you aware that there is a carve out for allocations to go to retailers that are in the "limelight?" Are you okay with allocations going to just restaurants, as the case may be? Are you okay with loving a wine that a wholesaler wants to move out and you ask for a better price on the final 15 cases, and the supplier telling you that you have wait nearly 60 days to receive it at that special price and then you can only get 1.5 cases (10% of the closeout)! Is that what you call "fair?" I am not a large store, but I have been at this 15 years now, and I would hate to see a portion of a "hard earned" allocation of mine go to some brand new store that just opened last year, because it is "fair." My standing order of 15 years getting slashed sounds pretty unfair actually. My clients can no longer get that wine from me. That sounds unfair. In no other market in any other industry in NYS or elsewhere is something so heavily scrutinized and over protected. If we want balance and fairness for retailers, then perhaps NYS should take over the system a la Pennsylvania. Then they can chop up the allocations to state stores and divide up the wine all across the state. That would be "fair," right? The irony, of course, is that even Pennsylvania decides where the "more allocated: wines should go and where they should not go. I will point out that I do not do any spirits (or wine for that matter) business with Southern Wines & Spirits. Should they be selling me Pappy Van Winkle, Natalie? NYS could stop posting quantity discounts on wine and spirits. Everything could be sold at the 1 case level. And then they could impose minimum pricing rules on all wines & spirits. Then we could become like Connecticut. Because that is another outstanding global wine market that we should strive to become like. How would that do for your internet business, Natalia? Imagine no longer being able to be competitive on a national level because you could no longer discount those allocated wines that you are seeking. It probably is not “fair” that a large retailer get access to more hard to get wines, or that they are able to charge lower prices because of it. It may also be “unfair” that one shop cannot get a product that another can because that is promised to a better customer. However, if that is what you are going to base a sweeping and, according to the WS article, punitive law on then there are almost NO business practices that would survive. I would be willing to bet that the State of New York gets discounts on any number of items it buys because of the size of their purchases and does not say, “wait a minute, this is not fair that you offer us a better price because we buy so much”. I would also point you towards drug stores as an example – did the State of New York try to intervene when “Mom and Pop” stores fell to Walgreens, CVS, Rite Aid, and the like – I’ll bet not. These huge national chains can buy drugs at much lower prices from the brand and generic marketers because of the volume. They can also get allocations that are much higher than individual stores, again because of the volume. If you are looking at that through the lens of the NYSLA, where is the fairness in that? The answer of course is that it is not fair, but it is commerce and that really should be what things are about. When we contrive to legislate competition we end up with a situation not unlike other parts of the world whose practices we disdain and openly criticize. Those stores that cannot get the good prices must do something that the big stores cannot; they must personalize service or offer something the “bigs” cannot. I have a friend here in Florida with a small wine shop. He cannot get the prices or the famous names that “superstore” places can, but his business is good and his customers loyal. Harkening back to the pharmacy example, small stores offer a personal touch, they stock things that big stores won’t, they compound prescriptions, and in short they build their business on their strengths. Those are “unfair” advantages they have over the big stores, and nobody would think of saying – cease and desist that enhanced customer service; you just are not playing fair. I therefore have to agree with the wine retailers in NY, and even though as a customer I would like to be able to go into any store anywhere and get the same price I could from a mega store on the quantity of wine that I wanted I realize that is ridiculous. There will always be things that someone finds is an anathema to them, and will petition a supposed authority or power broker to fix, however if we respond to every one of those we will constantly be swinging the pendulum back and forth across the same line. Let the market decide. Quantity discounts at the distributor/retailer interface are the heart and soul of free enterprise. My local wine merchant buys wine by the pallet and then sells it by the pallet-- to customers like me-- at incredibly low prices. Forcing them to pay the same price as a tiny mom & pop store will RAISE retailer's costs and thereby RAISE the price we consumers pay. So what will my retailer do? Probably shrink the store, since the advantages of scale are eliminated; and then lay off several full-time employees. Is there a winner in here somewhere? It was a shame that Natalia came here with that drive by comment. I have since learned that she owns a retail store in NY, that ships wine all over the country, via her website. Imagine if she had to stop shipping across state lines. Another issue at hand. Perhaps she will join us on that give us some feedback. Really quiet a fascinating topic and a lively discussion. What is illegal in the United States is considered a normal business practice in British Columbia. I had pre-sold a significant amount of a high end Italian wine. The wine had arrived in the importers warehouse but before the wine is sent to each customer the importer is obligated to inform the monopoly buyer a full list of restaurants and shops they pre-sold the wine to. The category buyer told the importer I could not have my allocation of wine even though their stores had sufficient quantities. In another instance another private store had ordered 1000 cases of an Australian wine, while the wine was being shipped to BC the wine received 90 points, the store never received the wines as the monopoly took it for theirs. The list of examples is endless, importers are afraid to speak up because of the potential ramifications.